Scheduling aircraft and pilot resources is key to running efficient flight operations. Effective aviation resource scheduling is the cornerstone of efficiency. During challenging economic times efficiency is something that every airline or airport manager stresses to subordinates. In the case of scheduling shared aircraft and pilot assets, efficiency and streamlined communications remains most important. Without these elements, workforce productivity suffers, flights may be delayed or cancelled, and ultimately, costs rise and profits contract. SMS Pro's Aircraft-Pilot scheduling software is a user friendly scheduling software solution solving the most challenging aircraft and pilot management needs. When it comes to scheduling clients, aircraft and pilots to shared aviation resources, SMS Pro's Resource Scheduler is not the most comprehensive scheduling software, but it is easy to use and effective. SMS Pro's Resource Scheduler is not flight planning software, but is useful for visually helpful to quickly identify where your resources are at a given time. Aircraft-Pilot Scheduler helps aviation organizations improve effectiveness, efficiency, and bottom line profits. Furthermore, Aircraft-Pilot Scheduler is built into your aviation safety management system software package. SMS Pro Aircraft-Pilot Scheduling software is flexible enough to provide a variety of resource management solutions for your entire airline or airport. Aircraft-Pilot Scheduler integrates easily with any calendar application your organization may use, such as Microsoft Outlook. 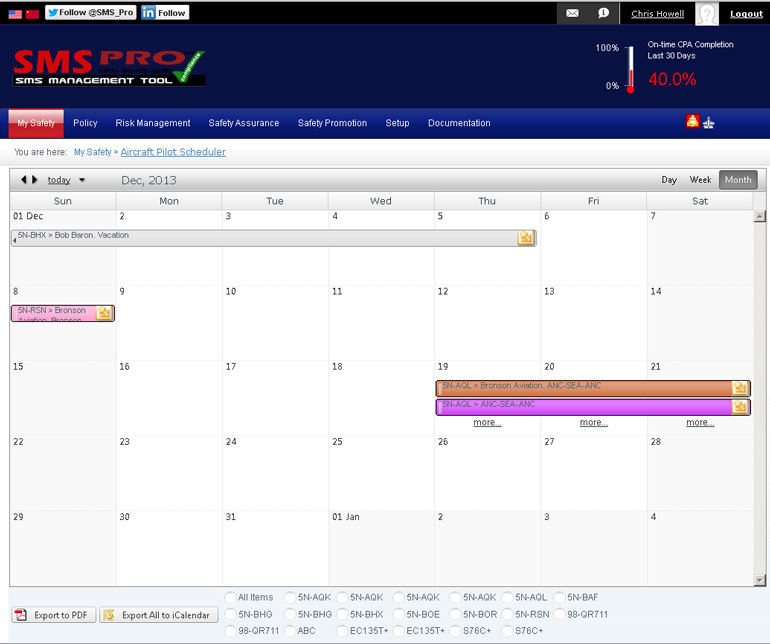 Users can export either an individual event or the entire visible calendar of events into their personal calendar. Furthermore, PDF export allows the transfer of information to users without direct access to your SMS Pro application. Currently, Aircraft-Pilot Scheduler is configured to manage aircraft and pilots; however, there are other solutions that SMS Pro Resource Scheduler software can handle with a few minor modifications, such as room management, instructors, classes, etc. You can have a separate Aircraft-Pilot Manager module for each division. This is accomplished by creating multiple pages in your SMS Pro portal and adding the Resource Scheduler on each of these pages that are dedicated to a particular task. For example, you may have operations in the United States and Eastern Russia. You can have a page dedicated to each of these operations and pilots/aircraft can float between operations. No two airlines or airports operate the same. SMS Pro users recognize quickly that SMS Pro is adaptable to your airline or airport. You don't have to adapt your airline or airport operations to SMS Pro. SMS Pro easily adapts to you! This is why we will develop customized Resource Scheduler options to help meet your specific needs. From reporting to managing other types of resources or services, we are here to help you. If you already use SMS Pro as your aviation safety management system software solution, you will already know that our customer service is world-class. SMS Pro's Aircraft-Pilot Scheduler works well with IPad or IPhone devices Furthermore all changes are made in real time helping to maximize room and resource utilization.